In the flower language of China, pink rose is the true love and friendship, and white rose expresses pure love, women’s crystal clear soul. 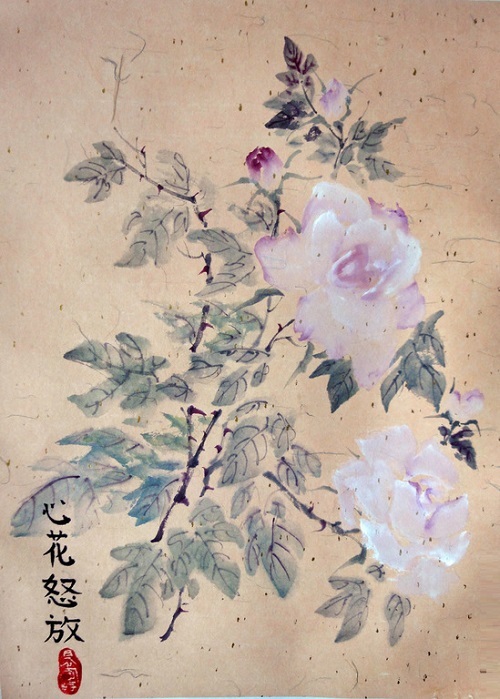 White-pink roses seem particularly delicate on peach paper with gold highlights. Signature “flowers of soul luxuriantly bloom“. Moscow based artist Galina (aka Progalina) is passionate about oriental culture, Chinese wisdom in painting, and philosophy hidden in hieroglyphs. Delicate Orchid naive and trusting, shows all its flowers. The hieroglyphic inscription “soul flowers have blossomed rapidly.” This statement is the joy of heart. 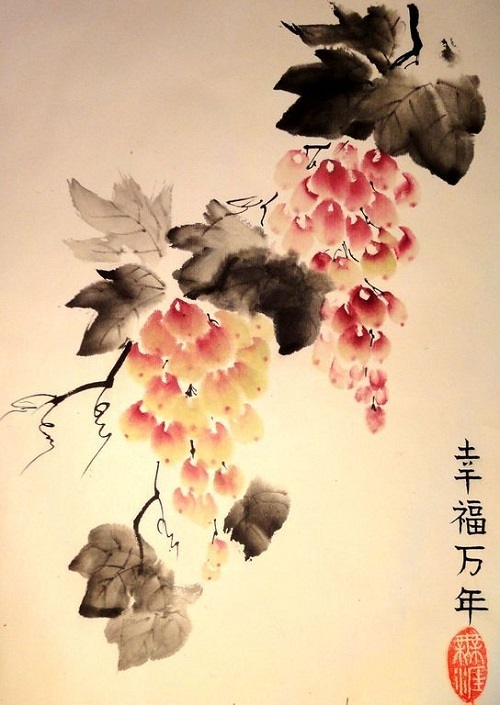 In China, a bunch of grapes – a symbol of abundance, fertility, joy, prosperity, material wealth, living in luxury and satiety. 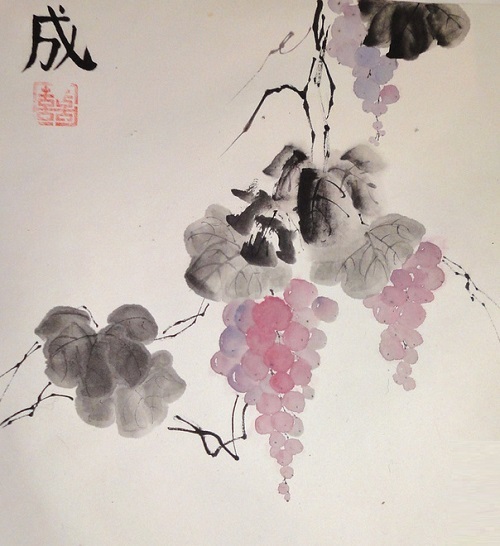 Also grapes – a symbol of health and longevity. The pictures with its image often presented at the newlyweds with a wish of durable and flexible attitude. Painting signed with hieroglyph “success”. She looks at him, he looks at the bug, and dandelions look at the sky – this is a story of love. And the signature “love”. 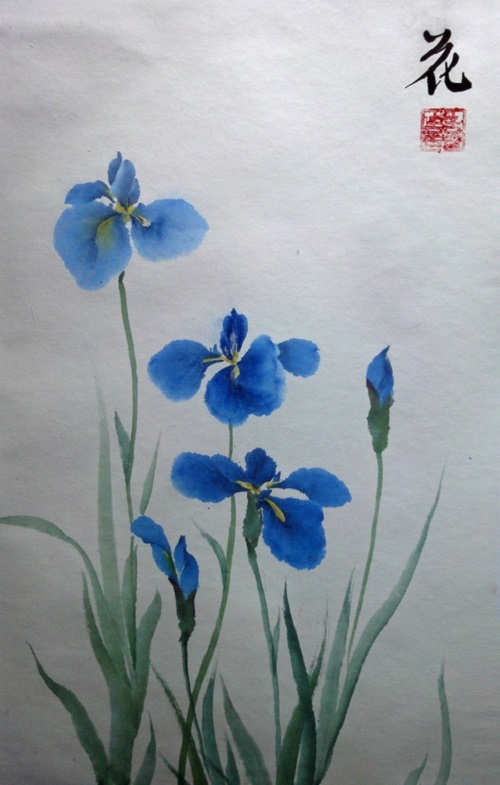 The ancient Greeks believed iris – fragments of the rainbow, and in Chinese culture, the Iris – a flower that protects the house from evil spirits. Iris also symbolizes grace, grace, tenderness. In Japan, the iris is the courage, valor and generosity; fighting spirit and irises are denoted by the same hieroglyph. Painting signed with hieroglyph “Flower”. Bright poppies leave no one indifferent. 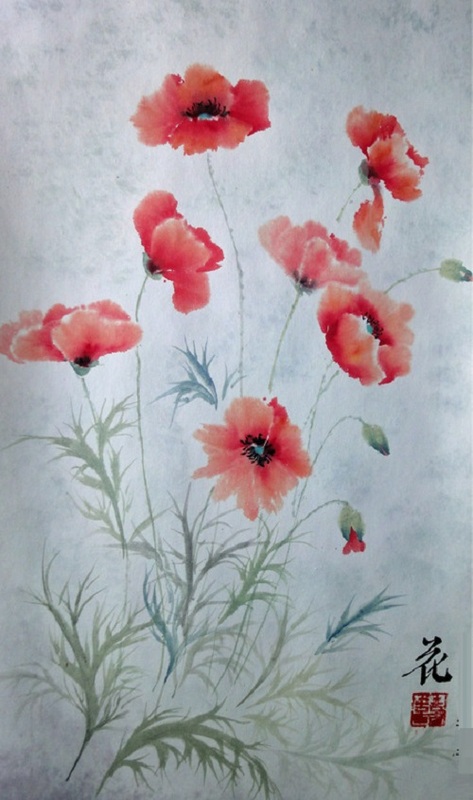 In China the image of the poppy is associated with the departure of the cases, rest, but at the same time and with success. 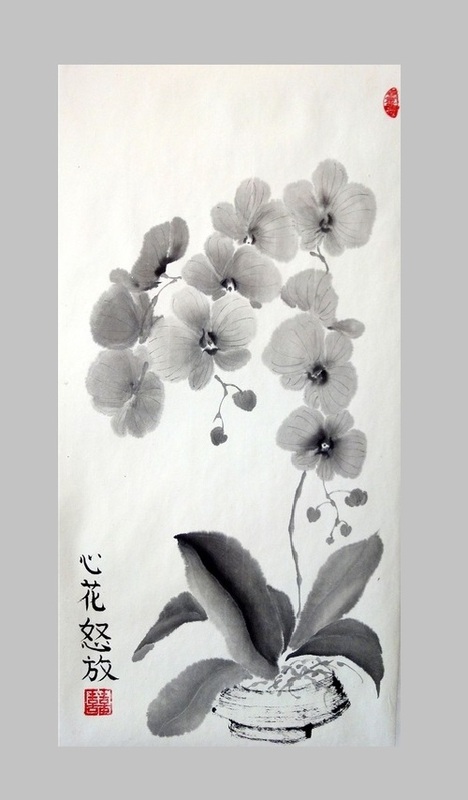 Painting signed with hieroglyph “flower”. 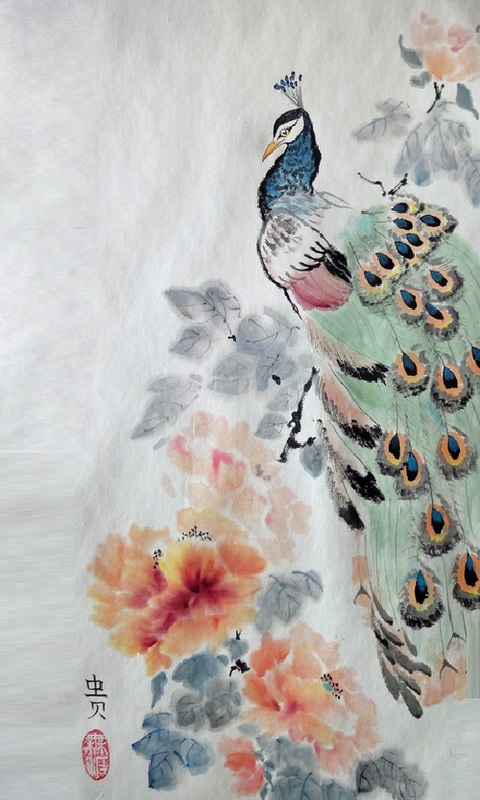 In the philosophy of the Chinese people, the image of the magnificent peacock contributes to success in work and career advancement. 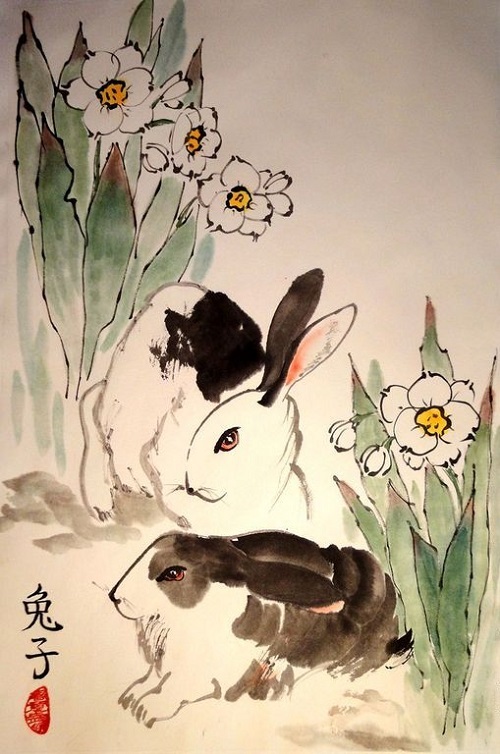 In addition, a large number of “eyes” on its tail is associated with wisdom. A peacock attracts all sorts of honors to the head of the house with its tail. 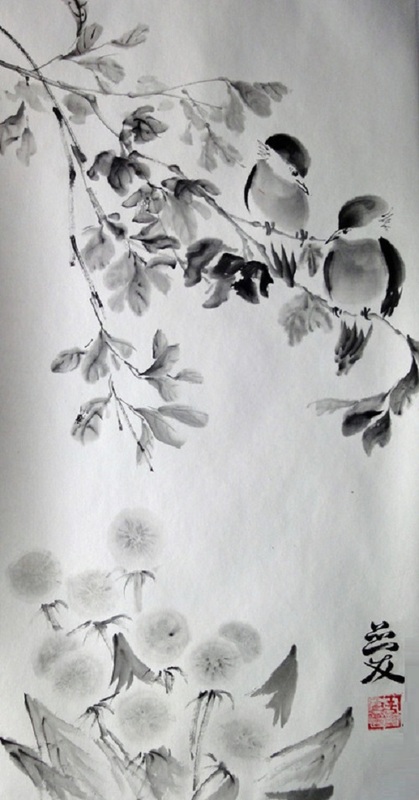 Image of peony enhances the symbolism of the peacock, because this imperial flower brings fame and fortune. Signature “high social status”. Regal lotus flower leaning toward the water, and the frog in a hurry to enjoy its aroma. 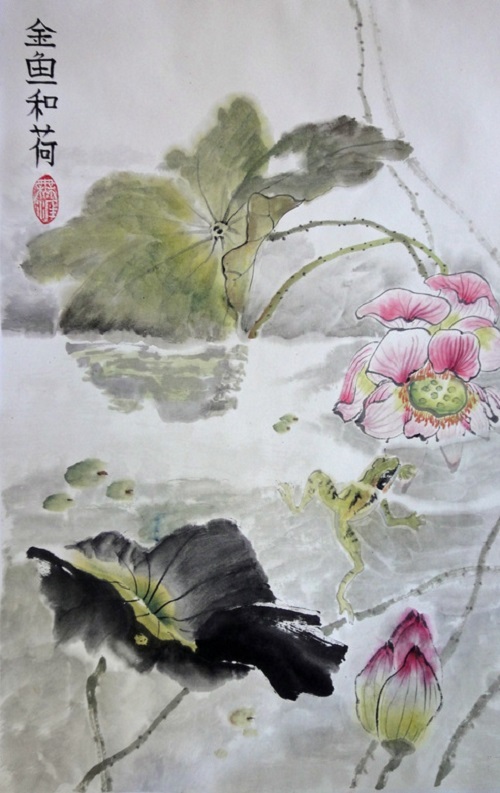 Lotus symbolizes spiritual growth in China, purity and wisdom, and the frog – a feng shui immortality, wealth and longevity. Signed wish of “harmony and gold in abundance”. Flight of the Bumblebee. 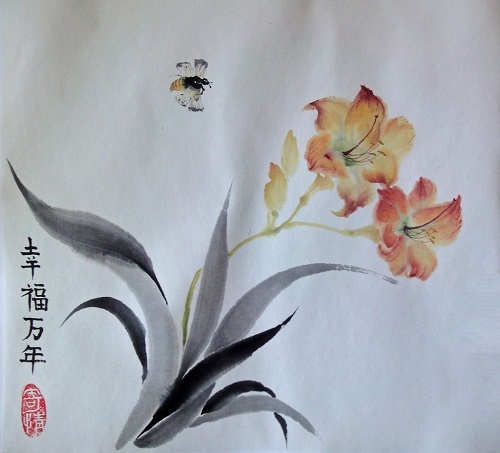 Daylily for the Chinese embodies carefree. An image of a flower and an insect is about love (flower embodies the feminine, insect – male). Signature “happiness for ten thousand years”. Reflections. 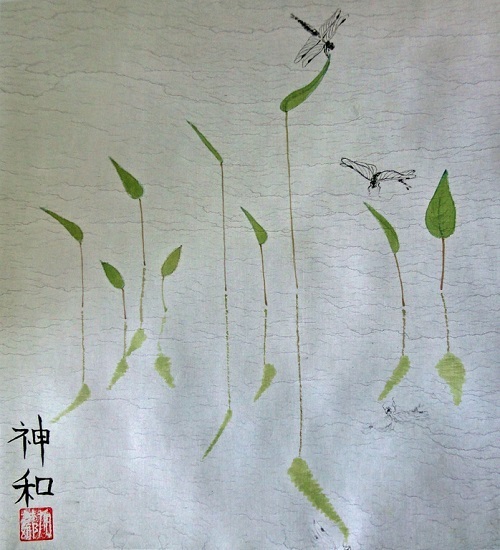 Above the surface of the water gently swaying leaves over leaves flying dragonfly, dragonflies float on clouds. Text ‘spirit world’.